Manhattan Vision offers comprehensive eye exams and is equipped with technologically advanced diagnostic instruments to diagnose, monitor and treat a wide range of eye conditions. Ultrasound is profoundly useful in the visualization of eye structures that may be difficult or impossible to see. Even with eye diseases that are clinically visible, this diagnostic tool assists in ruling out and differentiating eye diseases. This instrument measures the thickness of the cornea in various sections, information that’s critical in determining candidacy for refractive surgery. 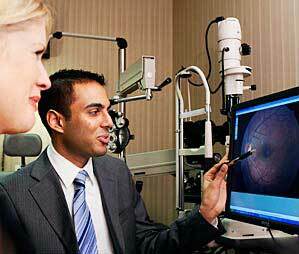 In recent clinical research, it has also been used to diagnose and monitor glaucoma. This device takes digital images of the front surface of the eye (cornea) and precisely maps its contours using a patented Arc-Step Algorithm. It allows us to monitor potential changes in vision or other disease processes that may cause physical discomfort or fluctuations in vision. Corneal topography is also useful for proper contact lens fit and for determining pre- and post-operative refractive surgery status. OCT provides high-definition imaging of retinal structures that cannot be clinically seen. Essential in giving comprehensive eye care for patients with various retinal diseases ranging from age-related macular degeneration and glaucoma to diabetes, this tool is an excellent method for detecting small changes in retinal diseases so they can be properly managed and treated. The GDX evaluates the health of the retina and optic nerve at a microscopic level. It’s very effective in the early detection of optic nerve damage due to diseases such as glaucoma, and records crucial information that can be used to monitor retinal disease and determine effective treatment. This diagnostic tool enables us to view the retina, macula, and optic nerve without dilating the pupil. 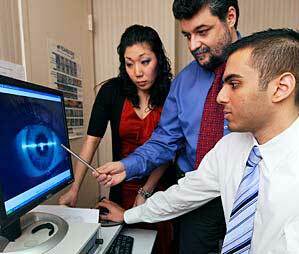 It takes high-resolution, high-magnification digital images used in monitoring specific eye conditions. A non-invasive device that provides visualization and analysis of the cornea, specular microscopy enables doctors to diagnose corneal diseases that may result from contact lens wear or eye surgery. This instrument also assists in the management of corneal diseases. This tool allows high-definition imaging of the structures in the front of the eye, enabling early detection of corneal abnormalities. The Visante also assists in proper care for glaucoma and helps your doctor decide if you’re a suitable candidate for refractive surgery. The Humphrey/Zeiss Visual Field Analyzer measures the point-by-point sensitivity of peripheral vision. This is important in diagnosing and monitoring glaucoma and neurological disorders that may have visual consequences. The Cirrus Optical Coherence Tomographer (OCT) offers unprecedented visualization of anatomical details, superior image data and provides correlation between OCT scan and fundus image. The Compact Touch STS UBM is a unique non invasive diagnostic tool providing information even in presence of opaque media and pigmented tissues. RAPDx is a pupil testing high-definition, machine-vision system the collects series of pupil responses and averages them into a consolidated response curve. 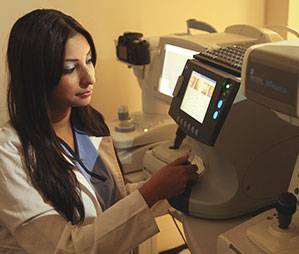 The Diopsys VEP and ERG systems is used for earliest detection of glaucoma and other retinal/optic nerve disorders. This cutting edge retinal imaging technology provides ultra-high resolution imaging with ultra-widefield autofluorescence capabilities.